Do you undervalue yourself, your role as a mom or your role in society? Most women do, but should not. The role of the Muslim woman is more than just someone who wears a scarf: she is the role model, the first teacher for children, and she is the religious guide for our Ummah (nation). There are reports that at one time in history a disbelieving army delayed their attack of the Muslims until they saw a larger number of women removing their head coverings. Whether or not this report is authentic, the message that it contains is indisputable and apparent. The non-Muslim army was wise enough to realise that the strength and power of a community and a nation is directly related to the level of righteousness of its members. So why is it that they looked to the Hijaab and actions of women rather than the dress, grooming and behaviour of men? The reason is that women play a critical role in the functioning of a nation. A role that is usually very obscure and often underestimated. That role has been threatened throughout history and continues to be in danger to this day. Dear sister, do not underestimate the value of a righteous woman. Do you realise the significant contributions you are making to your family, to your community, to the world? Have you ever thought that your submission and obedience to your Lord impacts the functioning of the whole society? Have you ever imagined what your life would be like if you were a woman without virtue and honor? Take a look at women such as this and you will have a clearer understanding. What is it that an immoral woman does to society? She spreads corruption throughout the land without concern or scruples. She becomes addicted to drugs and uses her income to buy the next hit instead of providing food and clothing for her children. She sells her body for a cheap price to men who are easily tempted. She displays her beauty and nakedness freely in an ostentatious show, luring even more men. She has an affair with a married man who works in her office. She dabbles in magic in order to separate a husband and wife. She tells lies and backbites with the intention of harming others. She neglects her children and allows them to follow the path of Satan. Is it not true that these things happen? We would be ignorant to deny these realities. What does this sort of conduct do to a society? A woman without righteousness can do much to damage the fabric of humanity. 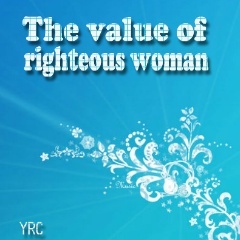 A righteous woman does much to enhance the harmonious operation of the society. She strives on a daily basis to increase her spiritual connection with Allaah through obedience to Him. She teaches her children the Quran, the Salaah (Prayer), the religion so that they may follow in the footsteps of submission. She makes her home an abode of peace, warmth and hospitality. She treats others with kindness and affection, especially her husband, her parents, her children, and her sisters in Islam. She gives everyone his or her due rights without complaint or argument. She helps to relieve the stress of her husband as he toils to provide for the family. She guards her beauty and her modesty as a means to respect herself, her husband, and her Lord. She is an honorable servant of Allah. You have done much more than you could ever imagine. Your contributions have been immense, yet at the same time undervalued. If it were not for you, humankind would be in an even sadder condition than it is today. You have helped to save it from utter ruin and destruction. You are the lifesaver and the life support. You are the pillar of society that keeps it from crumbling. You are the vicegerent on this earth that Allaah had intended. Your Hijaab has kept the invading forces at a distance. You will not allow them to occupy your mind, your heart, your soul or those of your children. Note your significant role and then continue your struggle, remembering the purpose of your work and the One for whom it is intended. Remember that you are a Muslim woman and that there is no other role that can compare. Recall that the Muslim nation needs you; all of mankind needs you. It is a mission and a duty that will continue until the end of time. And no matter what they do to attempt to destroy it, they will never be successful... for you are a righteous Muslim woman. Never, ever underestimate the value of a righteous woman.